"Trading Transparency" KNDL---Breaking All of My Rules! Hello Friends! Thanks so much for stopping by and visiting my blog, Stock Picks Bob's Advice! As always, please remember that I am an amateur investor, so please rememeber to consult with your professional investment advisors prior to making any investment decisions based on information on this website. A few moments ago, I broke all of my trading rules---much the same way that I did with Dynamic Materials (BOOM) a few months ago. Kendle announced 2nd quarter earnings results this morning, and unfortunately missed expectations by a nickel. The market is in a "take no prisoners" mode and decimated the stock this morning. Kendle is trading at $28.22, down $(7.38) or (20.73%) as I write. I went ahead, believing that this was entirely overdone, and entered a purchase for 800 shares (!) of Kendle at $28.4799. Hopefully, I shall be correct on this move, as this is actually a larger than average purchase for me, totalling $22,783.92. Let's review that earnings report and you will hopefully see why I would 'break' my trading rules and enter this stock purchase. Net service revenue for second quarter 2006 came in at $62.1 million, an increase of 24% over net service revenue in the same quarter last year. Net income for the quarter came in at $4.29 million, up about 200% from last year's $1.44 million result. Again on a per share basis, this worked out to $.29/share, up sharply from $.10/share last year. Fully diluted "adjusted" net income, still worked out as $.39/share up over 100% from last year's "adjusted" fully diluted net income of $.19/share. The Morningstar.com "5-Yr restated" is perfect. Almost perfectly steady revenue growth, earnings which dropped to a loss in 2002 at $(4.30)/share, have improved steadily, turning to a profit in 2004 at $.27/share, increasing to $.76/share in 2005, and $.93/share in the TTM. Even the number of shares outstanding has been fairly steady at 12 million in 2001, increasing to 14 million in the TTM. Free cash flow was $12 million in 2003, $18 million in 2005, and $17 million in the TTM. The Morningstar balance sheet shows $51.6 million in cash and $80.6 million in other current assets, easily paying down the $60.3 million in current liabilities and the $1.5 million in long-term liabilities combined. Anyhow, wish me luck. I am not following my intensely disciplined trading rules with this purchase. I am just trying to use my head and reserve the flexibility to make a purchase like this when things get entirely overdone imho. Thanks again for stopping by! If you have any comments or questions on this or anything else on the blog, please feel free to leave your comments right on the blog or email me at bobsadviceforstocks@lycos.com. Also, be sure to visit my Stock Picks Bob's Advice Podcast website, where, if you are so inclined :), you can listen to me as well as read what I write! I was looking through the list of top % gainers on the NASDAQ today and came across BE Aerospace (BEAV) which, as I write, is trading at $23.05, up $2.83 or 14.0% on the day. I do not own any shares or options on this stock. The overall market is anemic with the middle-east conflict and climbing oil prices once again hanging over the market. After reviewing some of what I consider relevant data, I thought that this stock deserved a spot on the blog! Let me share with you some of my observations. "... engages in the manufacture and marketing of cabin interior products for commercial aircraft and business jets. It also distributes aerospace fasteners. The company operates in three segments: Commercial Aircraft, Distribution, and Business Jet." Insofar as news driving the stock higher, the company announced 2nd quarter 2006 results and also announced an acquisition of Draeger, a German oxygen delivery system manufacturer for the aerospace market. For the three months ended June 30, 2006, net sales climbed 30.8% to $271.5 million, from $207.6 million in the same quarter in 2005. Net earnings for the quarter came in at $18.7 million or $.24/diluted share, up over 100% from the $8.4 million or $.14/diluted share last year. The company raised guidance for 2006 in the same announcement, guiding to $1.19/diluted share, up $.02 for the estimate. According to the MarketWatch report on the earnings, analysts had been looking for earnings of $.21/share on sales of $252 million. Thus, the company did a "trifecta-plus" as I like to irreverantly refer to the earnings report; that is, they increased their revenue, increased their net income, exceeded expectations and raised guidance all in the same announcement. The stock climbed with this report! How about longer-term results? Reviewing the Morningstar.com "5-Yr Restated" financials on BE Aerospace, we can see the steady (except for a dip in 2003) increase in revenue from $666.4 million in 2001 to $844.1 million in 2005 and $894.8 million in the trailing twelve months (TTM). Earnings, however, have been far less steady, dropping from a profit of $.78/share in 2001 to a loss of $(3.18) in 2002. The loss/share has been steadily improving until 2005, when the company reported a profit of $1.39/share and increased financial results to $1.50/share in the TTM. Free cash flow, which was negative in 2003 at $(37) million improved to a negative $(4) million in 2005 and turned positive at $24 million in the TTM. Reviewing the balance sheet, as reported on Morningstar, we find that the company has $140.5 million in cash and $434.2 million in other current assets. This works out to a total of $574.7 million in current assets, which, when compared to the current liabilities of $205.3 million yields a current ratio of 2.80. (Generally over 1.5 is considered 'healthy'). The company also has a not-insignificant $436.1 million in long-term liabilities. What about valuation? Looking at the Yahoo "Key Statistics" on BE Aerospace, we find that the company is a mid-cap stock with a market capitalization of $1.8 billion. The trailing p/e is a very moderate 16.05, and we find the current forward p/e (?) at 17.60. However, with the growth in earnings expected, the 5 Yr expected PEG is only 0.81. Using the Fidelity.com eresearch website for some more data, I found that BEAV is in the "Aerospace/Defence-Products/Services" industrial group. Within this group, BEAV has a very 'average' Price/Sales ratio of 1.7. Leading this group is Rockwell Collins (COL) with a ratio of 2.6, followed by BEAV at 1.7, then Orbital Sciences (ORB) at 1.5, Alliant Techsystems (ATK) at 0.9, DRS Technologies (DRS0 at 0.8, and EDO Corp (EDO) at 0.6. Profitability, however, puts BEAV near the top of the group with a return on equity of 24%. Leading the group is Rockwell Collins with a 39.6% ROE, followed by BEAV at 24%, Alliant Techsystems at 21.7%, EDO at 9.5%, DRS at 9.3% and Orbital Sciences at 7.8%. Finishing up the Yahoo review, there are 77.44 million shares outstanding with 76.42 million of them that float. Currently there are 3.70 million shares out short representing 3.6 trading days of average volume (the short ratio). No cash dividends are paid and no stock splits are reported on Yahoo. What about the chart? 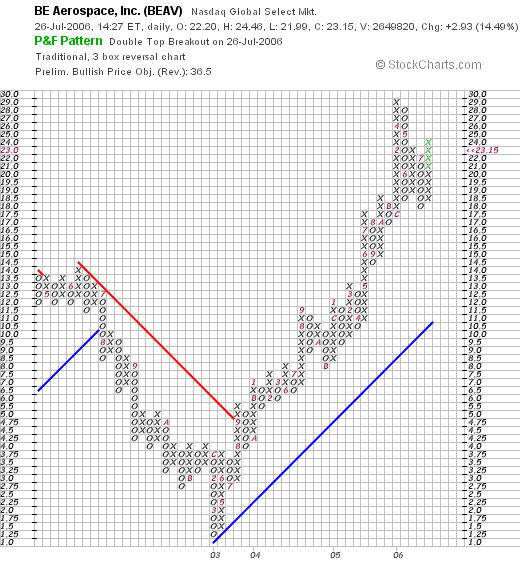 If we check the "Point & Figure" chart on BEAV from StockCharts.com, we can see that the stock was declining between July, 2002, when it was at $12.5, down to a low of $1.25 in March, 2003. Since then, the stock has moved strongly higher to the current level around $23.15. The stock chart looks strong to me! So what do I think about this stock? Well, let's review a few of the findings. First of all the company moved ahead strongly today on a great earnings report (they increased revenue, increased earnings, beat expectations, and raised guidance). The past five years have shown fairly steady improvement in the financial picture with growing earnings, revenue, and now positive free cash flow. The balance sheet is solid. Valuation-wise, the p/e is in the teens and the PEG is under 1.0. The Price/Sales ratio is fairly average within its industrial group, and the profitability of the company is above average in its group. Finally, the chart appears solid. I do not know about the variability of the aerospace market, especially with the climbing fuel prices, but it appears most of the financial results are already "in the bag". Thanks so much for stopping by and visiting! If you have any comments or questions, please feel free to leave them on the blog or email me at bobsadviceforstocks@lycos.com. Please be sure to stop by and visit my Stock Picks Bob's Advice Podcast Site. Hello Friends! Thanks so much for stopping by and visiting my blog, Stock Picks Bob's Advice. As always, please remember that I am an amateur investor, so please remember to consult with your professional investment advisors prior to making any investment decisions based on information on this website. I apologize for not doing a lot of posting the last couple of weeks. I am still working at building a new blog website but with the market correction, I frankly have not been motivated to look for new stocks....but have been posting my sales as they arise. With the market climbing once again today (two days in a row!) I figured I would be able to find a stock or two that I liked. In fact, Hologic (HOLX), an old favorite of mine, was on the list of top % gainers, and the last price I have for it is $48.34, up $3.47 or 7.73% on the day. It is near the close of trading and probably is the closing price. I don't have any shares of HOLX in my Trading Account but my son does own literally 20 shares and my stock club also has purchased shares in Hologic. I first posted Hologic on Stock Picks Bob's Advice on April 27, 2005, when the stock was trading at $35.85. HOLX had a 2:1 stock split on December 1, 2005, making my effective stock pick 'price' actually $17.93. With today's closing stock price of $48.34, this represents an appreciation of $30.41 or 170% since posting the stock just a little over a year ago. And to think I didn't buy any shares for myself! At least I talked my stock club into this stock and bought a few shares for my son's account!
" ...engages in the development, manufacture, and supply of diagnostic and medical imaging systems for serving the healthcare needs of women. It focuses on mammography and bone densitometry." Next, what about the latest quarterly report? Actually, it was the third quarter 2006 earnings report release that sparked today's rally in the stock. Revenue for the third quarter ended June 24, 2006, came in at $119.7 million, a 62% increase over the $74.1 million reported in the same quarter last year. Net income increased 46% to $12.0 million or $.25/diluted share up from $8.2 million or $.18/diluted share in the same quarter last year. How about longer-term results? If we check the Morningstar.com "5-Yr Restated" financials on HOLX, we can see that revenue has been steadily increasing from $180.2 million in 2001 to $287.7 million in 2005 and $341.2 million in the trailing twelve months (TTM). Earnings during this period have increased from a loss of $(.67)/share in 2001 to a profit of $.01/share in 2002, $.63/share in 2005 and $.75/share in the TTM. The company has been increasing its number of shares outstanding from 31 million in 2001 to 43 million in 2005 and 46 million shares outstanding in the TTM. I would rather see a stable number of shares all things being considered, however, with the solid growth in revenue in earnings, the company has been growing its financial results faster than its outstanding shares! Free cash flow has been a bit erratic but has increased from a negative $(4) million in 2003 to $37 million in 2005 and $17 million in the TTM. The balance sheet looks solid with $108.3 million in cash, more than enough to cover the combined $65.4 million in current liabilities and the $5.3 million in long-term liabilities combined. Calculating the 'current ratio' gives us a total of $256.1 million, which when divided by the $65.4 million in current liabilities, yields a current ratio of 3.92. (1.5 or higher is the minimum for good financial health as a rule). And how about some updated statistics/valuation numbers on this company? Looking at the Yahoo "Key Statistics" on Hologic, we find that the company is a mid-cap stock with a market capitalization of $2.20 billion. The trailing p/e is certainly rich at 65.01, and the forward p/e (fye 24-Sep-07) isn't much better at 40.48. The PEG, however, suggests a more reasonable valuation of the p/e, that since due to the rapid growth in earnings, the PEG is estimated at 1.32 (5 yr expected). Reviewing the Fidelity.com eresearch website, we find the Hologic is in the "Medical Appliances/Equipment" industrial group, and is in fact the most richly valued of the group in terms of the Price/Sales ratio. HOLX leads this group with a Price/Sales ratio of 6.2. Following Hologic is Medtronic (MDT) at 5.1, St Jude (STJ) and Zimmer Holdings (ZMH) both at 4.2, Biomet (BMET) at 3.9 and Edwards Lifesciences (EW) with a Price/Sales ratio of 2.9. Insofar as profitability, using the 'return on equity' (ROE) as a guide, we find that Hologic is only average in this measure. Leading the group is Biomet with a ROE of 25.9%, Medtronic at 23.8%, Zimmer at 16.6%, then Hologic at 15.1%, St Jude at 14.4% and Edwards Lifesciences at 13.8%. No cash dividend is paid and as I noted above, the company last split its stock on 12/1/05 when it declared a 2:1 stock split. We can see a beautiful graph with an almost perfectly ascending price progression until May, 2006, when the stock sold off down to almost its support level. The stock appears to be appreciating once again. So what do i think? I think the company reported a terrific quarter, has an outstanding Morningstar.com report (except for the very mild dilution of shares), and has a nice chart. Valuation, however, appears a bit rich and the stock thus appears to be "priced to perfection." Hopefull the company will continue to deliver perfect results. Certainly, the company's digital mammographer is selling well and this type of cancer detection may have some advantages over prior diagnostic procedures. with the p/e in the 60's and even the forward p/e in the 40's, fortunately we have a PEG just over 1.2. Even as measured by the Price/Sales ratio, the stock price appears rich. And profitability is not quite so phenomenal either. Only the rapid growth in earnings will continue to drive the stock higher. Anyhow, that's the pick for this afternoon! A great performance from last year. Hopefull, for my son and my stock club, the stock will continue to perform well. Valuation, however, is a bit rich for what you are getting imho. Thanks again for stopping by! If yhou have any comments or questions please feel free to leave them on the blog or email me at bobsadviceforstocks@lycos.com. Also, please be sure to stop by and visit my Stock Picks Bob's Advice Podcast Website! One of my weekend tasks that I try to address is the review of past stock picks on this blog. For ease of evaluation, I use a "buy and hold" assumption of past picks. In reality, I advocate and employ a disciplined buying and selling strategy with all of the stocks that I choose to own. This of course would affect the ultimate price performance of any investment. Since I have again missed a couple of weeks in this review process, my trailing 52 weeks is getting closer to a trailing 65 weeks! In fact, I did review the week of March 28, 2005, but there weren't any stocks "picked" that week. My previous full review was on June 24, 2006 when I reviewed past picks from the week of March 21, 2005. Thus, I am now up to the week of April 4, 2005, which was a busy week for me on the blog! Let's take a look at those stock picks and see how they would have performed if we had purchased equal dollar amounts of the selections. On April 4, 2005, I posted Jos A. Bank (JOSB) on Stock Picks Bob's advice when it was trading at $31.88. JOSB had a 5:4 stock split on 2/16/06, making my effective pick price actually only $23.88. JOSB closed on 7/21/06 at a price of $25.64 giving me a gain of $1.77 or 7.4% since "picking" the stock. On June 8, 2006, JOSB announced first quarter 2007 results. For the quarter ended April 29, 2006, sales increased 17.7% to $113.7 million as compared with $96.6 million in the same quarter last year. Comparable store sales grew 4.7% during the period and combined catalog and internet sales climbed 25.0%. Net income, however, declined to $5.9 million or $.32/share, down from $6.7 million or $.38/share the prior year. On April 5, 2005, I posted Greif Inc. (GEF) on Stock Picks Bob's Advice when it was trading at $74.06. GEF closed at $67.97 on 7/21/06, for a loss of $(6.09) or (8.2)% since posting. On May 31, 2006, GEF announced 2nd quarter 2006 results. For the quarter ended April 30, 2006, net sales grew 1% to $620.1 million from $613.0 million in the same quarter last year. GAAP net income came inat $28.7 million or $.97/diluted Class A share and $1.49/diluted Class B share, compared to GAAP net income of $16.8 million or $.57/diluted Class A share and $.88/diluted Class B Share in the prior year. 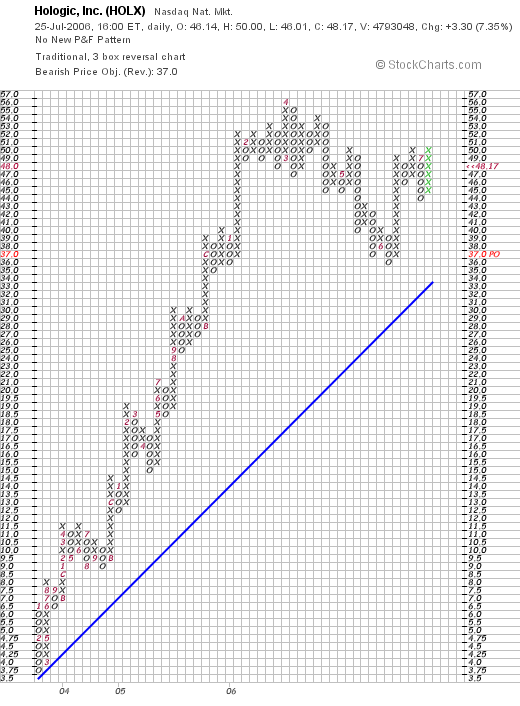 On April 7, 2005, I posted Bed Bath and Beyond (BBBY) on Stock Picks Bob's Advice at a price of $40.80. BBBY closed at $32.62 on 7/21/06 for a loss of $(8.18) or (20.0)% since listing. On June 21, 2006, BBBY reported 1st quarter 2006 results. For the quarter ended May 27, 2006, net sales were $1.396 billion, a 12.2% increase from net sales of $1.244 billion in the same quarter in 2005. Net earnings for the quarter came in at $100.4 million, or $.35/diluted share, up from $98.9 million or $.33/diluted share the prior year. During the quarter, the company reported comparable store sales growth of 4.9%, better than the 4.4% same store growth in sales reported last year. Finally, on on April 8, 2005, I posted Buckle (BKE) on Stock Picks Bob's Advice when the stock was trading at $35.60. Buckle closed at $37.90 on 7/21/06 for a gain of $2.30 or 6.5% since posting. On May 18, 2006, Buckle reported 1st quarter results. For the quarter ended April 29, 2006, sales came in at $109.6 million, up from $105.5 million. Income increased to $9.4 million or $.47/share, up from $8.6 million or $.40/share in last year's same quarter. However, same store sales, a better indicator imho of the long-term potential of a retail firm, declined (1.3)%. Thus, even though sales overall grew, this result was influenced by new store openings and results were not quite as encouraging taking into consideration the shrinkage of same store sales results. So how did I do for that week in April last year? Well, the average performance of the four stocks listed came in at a loss of (3.6)% with two stock losing and two stocks gaining....but the loss in BBBY biased the entire group into a losing result. Thanks so much for stopping by and visiting! If you have any comments or questions, please feel free to leave them on the blog or email me at bobsadviceforstocks@lycos.com. Also, please be sure to stop by and visit my Stock Picks Bob's Advice podcast website! I confess that all of this bear market is wearing me down! Earlier today, I sold one of my remaining twelve holdings in my trading account: Barnes Group (B) that hit an 8% loss. In fact, I sold my 360 shares that were acquired 2/16/06 at a cost basis of $19.58/share at a price of $17.97. This represented a loss of $(1.61)/share or (8.2)5 since purchase. Again, since I sold this stock at a loss instead of on a gain, this is a negative internal signal of my portfolio telling me once again to hang on to the proceeds and sit on my hands. I am now down to 11 positions from my maximum of 25, and still above my minimum of 6. Hopefully the crisis in the middle-east will soon be resolved and the markets will move higher once again. I hope I am not too much of a Polyanna about these international events. Thanks so much for stopping by and visiting! If you have any comments or questions, please feel to leave them on the blog or email me at bobsadviceforstocks@lycos.com. Also, please be sure to come and visitn my Stock Picks Bob's Advice Podcast site where you can hear me talk about many of the same stocks I have been writing about the past several years. 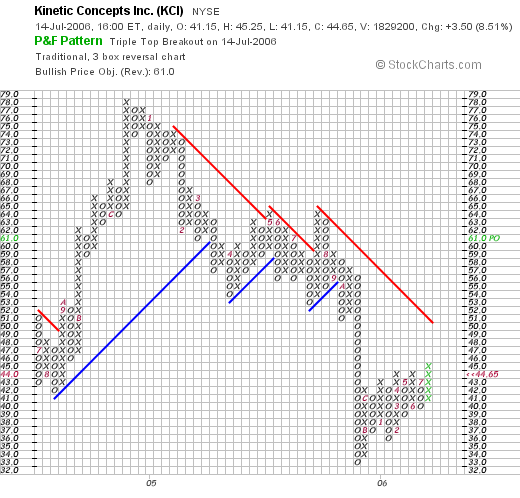 and came across Kinetic Concepts (KCI), trading as I write at $44.45, up $3.30 or 8.02% on the day. I do not own any shares nor do I have any options on this stock. In fact, I was planning to write this one up yesterday, but you know how that goes....one thing leads to another and pretty soon I haven't written anything at all! I shall try to keep this brief and get the information on this company posted this afternoon! First of all, what does this company do? According to the Yahoo Profile on Kinectic, the company "...engages in the design, manufacture, marketing, and service of wound care and therapeutic products in the United States and internationally." On April 25, 2006, KCI reported 1st quarter 2006 results. For the quarter ended March 31, 2006, total revenue increased 14% to $319.2 million. Net earnings increased 31% to $48.5 million and net earnings per share increased 29% to $.66/share. Reviewing the 5-Yr Restated Financials from Morningstar.com, we can see revenue increasing steadily from $.5 billion in 2001 to $1.2 billion in 2005. Earnings per share increased from $1.67/share in 2005 to $1.82/share in the TTM. Free cash flow is positive with $204 million in 2003, $95 million in 2004 and $144 million in 2005. KCI reported $125 million in free cash flow in the trailing twelve months (TTM). The balance sheet looks fine with $136.5 million in cash and $365.8 million in other current assets. With $200.6 million in curretn liabilities, this yields a current ratio of about 2.5. Long-term liabilities are not insignificant at $331.0 million, but the current assets are approximately equal to the combined short and long-term liabilities. Looking at Yahoo Key Statistics on KCI, we can see that this is a large cap stock with a market capitalization of $3.2 billion. The trailing p/e is moderate at 24.45, but the forward p/e is even nicer at 14.78 (fye 31-Dec-07). Thus, with the rapid growth, the PEG works out to 0.91. Reviewing the Fidelity.com eResearch website, we can see that this company is in the "Medical Appliances/Equipment" industrial group. Within this group, the stock's valuation is quite reasonable as measured by the Price/Sales ratio with this company coming in dead last at 2.4. Topping this group is Medtronic (MDT) with a Price/Sales ratio of 5.1, followed by St. Jude (STJ) at 4.2, Zimmer (ZMH) at 4.2, Biomet (BMET) at 3.9 and Edwards Lifesciences (EW) at 2.9. Interestingly, looking at profitability, even though this company is the cheapest in valuation it is top in profitability with a return on equity of 73.2%. This is followed by Biomet at 25.9%, Medtronic at 23.8%, Zimmer at 16.6%, St. Jude at 14.4% and Edwards Lifesciences at 13.8%. This is an interesting combination of a cheap stock with great profitability. Going back to Yahoo for some more numbers, we find that there are 71.68 million shares outstanding wtih 57.9 million that float. Currently, as of 6/12/06, there were 1.64 million shares out short representing 2.8% of the float and only 2.5 trading days of average volume (the short ratio). No dividend is paid and no stock split is reported. So what do I think about this stock? Well it is an interesting company that has been moving higher the past two days in an otherwise very weak market. I suspect that earnings are due....maybe investors think the news will be strong (?). The last quarter was great, the Morningstar.com report looks nice, and valuation is attractive with a p/e in the low 20's, a PEG under 1.0, a Price/Sales ratio the lowest in its group and the profitability, as measured by return on equity (ROE), the highest in its group. Finally the chart looks interesting....the stock price does appear to be moving higher after a significant correction in valuation. Anyhow, that's my stock for today! Thanks so much for stopping by and visiting! Please note that although I write up a stock today, I do not recommend purchase of any stock unless one has a "buy signal" generated by your own portfolio....that is one of your stocks is at a partial sale point due to price appreciation. If you have any comments or questions, please feel free to email me at bobsadviceforstocks@lycos.com or just leave them on the blog. Also, please be sure to stop by and visit my Podomatic.com podcast site! A few moments ago I sold my 120 shares of Toro (TTC) when it hit an (8.9)% loss. The shares were sold at $44.06. I had purchased these shares just a few weeks ago on 5/25/06 at a cost of $48.36. As I do with sales on bad news, I shall be sitting on my hands once again as my portfolio continues to shrink in the face of the ever-continuing bear market. Thanks so much for stopping by. I hope you are faring better than I am! If you have any comments or questions, please feel free to email me at bobsadviceforstocks@lycos.com or just leave your comments on the blog. Also, be sure to visit my Stock Picks Bob's Advice podcast site. Hello Friends! Thanks so much for stopping by and visiting my blog, Stock Picks Bob's Advice. As always, please remember that I am an amateur investor, so please remember to consult with your professional investment advisors prior to making any investment decision based on information on this website. The market continues to dictate my actions. A few moments ago another of my recent purchases, Genesco (GCO) hit an 8% loss and I sold my shares. The exact details were 200 shares of Genesco sold this morning at $31.59. I had purchased these shares 5/26/05 at a cost basis of $34.40/share. Thus, my loss was $(2.81) or (8.17)% since my purchase. This brings my portfolio down to 13 positions from my maximum planned of 25, and still above my minimum level planned of 6 positions. I, as you know, shall once again be sitting on my hands, as I like to say, with the proceeds. I am still waiting for a sale on good news to give me the permission slip to add a new position to my shrinking :( portfolio. If you are new to the blog, I use a sale at a targeted appreciation point to allow me to add a new position in my trading portfolio. By not re-investing stocks sold on bad news, I have a primitive system of responding to market activity: moving into cash in bad markets and moving back into equities when things are going well. We all try to do this; the only difference is that my particular approach doesn't require me to make that decision. I allow my own stocks to dictate my response to market action. Time will tell how successful this approach shall be! Thanks again for visiting. If you have any comments or questions, please feel free to leave them on the blog or email me at bobsadviceforstocks@lycos.com. If you have an mp3 that you can send me with a comment or question, please do so at bobsadviceforstocks@podomatic.com so that I can include it in my Stock Picks Bob's Advice Podcast! 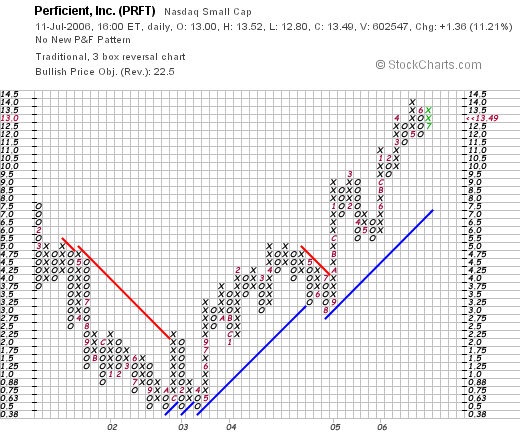 I was looking through the list of top % gainers on the NASDAQ today and came across an old favorite of mine; in fact, a stock that I also had owned in the not too distant past: Perficient (PRFT). Perficient closed at $13.45, up $1.32 or 10.88% on the day. I first posted Perficient on Stock Picks Bob's Advice on March 4, 2005, when the stock was trading at $9.33. With today's close at $13.45, this represents a nice gain of $4.12 or 44.2% since posting this stock a little over a year ago. Unfortunately, I was unable to hang on to my shares which I purchased on 3/4/05 at $9.26, and then sold them rather quickly with a (10.7)% loss on 3/8/05 at $8.37. As I had pointed out on my post when I purchased shares, stocks at $10 or less are quite volatile, and if you wish to stick to 8% loss limits, you are rather likely to get 'shaken out'. Let's take another look at this stock. I shall, in my effort to keep posts easy for me, limit the pictures and get right to the information. "...provides information technology consulting services primarily to Global 2000 and midsize companies in the United States. It engages in the design, building, and delivery of ebusiness solutions using a set of software products." Looking through the Yahoo "headlines" on Perficient to see why the stock moved higher, we can see that the company raised 2nd quarter revenue guidance, with revenue now expected between $36.6 million to $37.7 million, up strongly from prior guidance of revenue of $31 to $32.8 million. Once again, we can see the effect of both the growth in revenue as well as the company's guidance for the street affecting the stock price in a very direct fashion! Looking for the latest quarterly results, I found the 1st quarter 2006 results for PRFT, which was reported on May 3, 2006. Total revenue climbed 50% to $29.6 million from $19.7 million the prior year same period. GAAP earnings per share came in at $.07/share, up from $.06/share last year. This year's results is better than it appears, as this year now includes appropriate inclusion of the cost of "non-cash stock compensation" this year, compared to last year when no such expense was included. How about longer-term results? Reviewing the Morningstar.com "5-Yr Restated" financials, we see the steady growth in revenue from $20.4 million in 2001 to $97 million in 2005 and $106.9 million in the trailing twelve months (TTM). Earnings have increased from a loss of $(7.01)/share in 2001 to a profit of $.07 in 2003 and a profit of $.29/share in the TTM. On a negative note, the company certainly has been growing quickly, but has apparently done so with acquisitions and the floating of additional shares of stock. While PRFT has 6 million shares in 2001, this grew to 22 million in 2005 and 25 million shares in the TTM. Hopefully a greater portin of Perficient's growth in the future will be from organic growth of existing businesses and less from acquisitions. Free cash flow is positive and growing with $2 million in 2003, $4 million in 2004 and $7 million in 2005. They are reporting $8 million in free cash flow in the TTM. The balance sheet according to Morningstar.com looks solid with $2.3 million in cash and $25.2 million in other current assets. Calculated, this works out to a current ratio of 2.8. Indeed, the total current assets can easily pay off the combined current and long-term liabilities which togeter add up to $11.8 million. Looking at Yahoo "Key Statistics" on PRFT, we find that this is a small cap stock with a market capitalization of $334.86 million. The p/e is rich at 46.88, but the company is growing so fast that the forward p/e is 23.26 and the PEG works out to a ratio of 1.07. Using the Fidelity.com eresearch website, we find that Perficient is in the "Business Software & Services" industrial group. Within this group, the stock is reasonably priced with a Price/Sales ratio of 3. Leading off this group is BEA Systems (BEAS) with Price/Sales ratio of 4. This is followed by First Data (FDC) at 3.2, Perficient at 3, Automatic Data Processing (ADP) at 2.9, Fiserv (FISV) at 1.9 and Business Objects (BOBJ) at 1.8. Again, since this is a small company which is just now growing its profitability, it is priced based on future anticipated results and not the current profit. This is reflected in the ROE (Return on Equity) ratio. Topping this group is Fiserv at 19.7%, then First Data Corp. at 19%, Automatic Data Processing at 18.9%, BEA Systems at 13.2%, then Perficient at 11.8% and at the bottom is Business Objects at 5.8%. Finishing up with Yahoo, we can see that there are 24.82 million shares outstanding with 21.99 million of them that float. As of 6/12/06, there were 921,510 shares out short representing 3.7 trading days of volume. This short interest represents 4.6% of the float, and does not appear very significant to me. We can see that while the company moved lower between January, 2001, when it was trading as high as $7.50, dropping to a low of $.50/share in September, 2002, the stock subsequently and certainly since last year when I first posted the stock, has been moving ahead strongly and steadily. So what do I think of the stock? Well I liked it enough last year to buy some shares :). I don't own any shares or options now. However, the strong guidance to higher revenue numbers is encouraging. The latest quarterly report was encouraging, especially with the added accounting requirements. Morningstar.com looked good except for the fairly significant growth in the float the past few years. And valuation, while not that exciting, still came in with a PEG just over 1.0, and other numbers in the middle of their group. The balance sheet is solid, and the company is spinning off growing amounts of free cash. Finally, the chart still looks strong, and certainly the stock has been on a tear since last year! Thanks so much for stopping by! If you ahve any comments or questions, please feel free to leave them on the blog or email me at bobsadviceforstocks@lycos.com. Also, don't forget to drop by and visit my Stock Picks Bob's Advice Podcast site. Hello Friends! Thanks so much for stopping by and visiting my blog, Stock Picks Bob's Advice. As always, please remember I am an amateur investor, so please remember to consult with your professional investment advisors prior to making any investment decisions based on information on this website. Keith from Melbourne, Florida, was kind enough earlier this week to let me know that my latest podcast was missing the final ten minutes. I corrected the problem, although I did overlap about 30 seconds...I shall work on my Audacity skills....I promise! It is repaired. I was able to download it but it went right into Qucktime so I was not able to download it to my IPOD or even save it to my HD. I was hoping to be able to do it so I could save it and listen to again. Also thank you for the shout out. I will check out the microphone to send you an MP3. Could you put the instructions or site on your Blog? Let me try to answer your question Keith. First of all, the easiest thing to do, imho, is to pick up an inexpensive headphone/microphone combination at Best Buy, Circuit City, or your local electronics/business store. (I don't have any stock in those two, it is just I have access to Best Buy). If you go to my main podomatic page..you should see a place to leave comments along the right side of the page. You can either directly record these comments on Podomatic or you can create an mp3 file with freeware like Audacity or Garage Band if you have a Mac...this is a little harder because as I understand it you need to export it into iTunes then export it back to your desktop as an mp3...I prefer Audacity. You can find Audacity by going to http://audacity.soundforge.net and download it for free. If that link doesn't work just search under "Audacity recording software" on Google. Let me know how this works and looking forward to including my first guest mp3 into the podcast. Let me know how your club is doing and what you all think of my process....Thanks again Keith!